he Myanma Port Authority is a government agency vested with the responsibility to regulate and administer the coastal ports of Myanmar. The modern era of the Port of Yangon began in 1880 with the Commissioners for the Port of Rangoon. 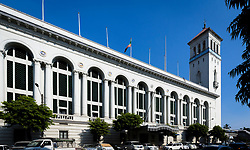 In 1954, the Board of Management for the Port of Rangoon was established, and then in 1972 the Burma Ports Corporation. The MPA was founded in 1989 to replace the Burma Ports Corporation.